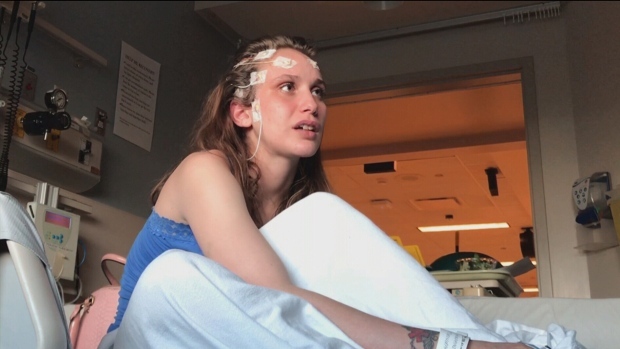 Tavia Marlatt, young epilepsy patient is refusing to leave Vancouver General Hospital without assurances she’ll receive the supervision and healthcare supports she needs at home. Marlatt and her family have been battling Fraser Health since she aged out of youth-oriented support. She suffers up to 50 seizures a day, some of them minor but others serious enough to cause serious bodily harm. The 22-year-old recently fell and broke her jaw in several places and her mother says her new diagnosis rates her epilepsy as critical. Marlatt says the battery of tests over the past week found her daughter’s seizures are coming from three parts of her brain, making them difficult to mitigate with surgical intervention. Other tests found a previous brain surgery to control her epileptic seizures resulted in the lack of inhibition and impulse control, combined with difficulties in planning, judgement and insight, that have had Marlatt keep a close eye on her daughter since she moved back home following her facial injury. Marlatt said what the family needs is someone who can watch her daughter when she’s at work – specifically, someone who is qualified to administer medications and is trained in seizure management. “We want to know and Tavia wants to know she’s safe when I’m not there,” Marlatt said. On Thursday afternoon, Fraser Health said it has offered to move the patient to another health care facility closer to home as it works on a long-term plan with her family. Marlatt said she’s “guardedly optimistic” about the development, which she learned about after Fraser Health passed a message on through staff at Vancouver General. She said her daughter will stay at VGH for another night before they decide how to respond. The family said Fraser Health has previously pushed for her to be placed in a group home. But with Tavia’s lack of impulse control and mercurial temperament, not to mention overlapping health issues with her acquired brain injury and epilepsy, Marlatt says that’s just not the right environment for her daughter – especially considering she’s so young. Marlatt is reaching out to health minister Adrian Dix to intervene in this case. She says she has no issue with Vancouver General Hospital making room for another patient in the epilepsy ward, but wants to make sure her daughter is safely supervised by qualified people until their situation is resolved.